I will admit that I finally signed up for Twitter a week ago, so I am a few years behind. I didn’t really understand the importance of Twitter until I hopped on the bandwagon. I was confused by all the hash marks and other symbols, that I didn’t recognize how powerful Twitter is as a business and marketing tool. Using 140 characters or less, Twitter can help any business promote and share its marketing efforts to a vast amount of people. Since Twitter is one of the largest social media outlets in the world, it has also become a new form of communication. Twitter is used to share content. Businesses want to share content to attract potential customers. So here’s a crazy idea: businesses can share their content on Twitter to attract customers to their company. Twitter may seem confusing at first, but it is actually easy to use and provides many benefits to businesses. Those are just a few benefits Twitter provides for businesses and marketers. Twitter also allows you to unleash your creative side. You can customize your profile, add a picture, and create a descriptive bio. 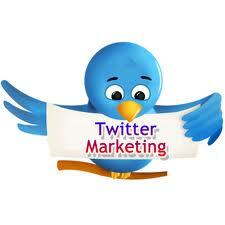 Creativity combined with interesting and knowledgeable tweets will allow any business to be successful on Twitter. So the question is: to tweet or not to tweet? I will let you decide. Packaging design is a critical decision making criteria for consumers. The first sense we use when we shop is our sight, which means we see packaging before we see the actual product. Marketers need to make sure packaging is appealing so it will entice consumers to make a choice and purchase. A new trend in packaging is going back in time and creating a retro look and feel. Retro packaging design adds a dash of nostalgia and curiosity. Below are three products that have embraced the retro trend and used the idea in their packaging design. 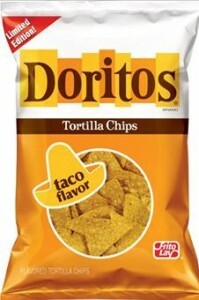 Doritos wanted to relaunch their taco flavor chips so they decided to reintroduce them in the original 1960s packaging. Consumers have made comments online about how much they miss the taco flavor. So Doritos listened to those people and brought the taco flavor and its retro packaging back to life. They also announced that the taco flavor will remain in the permanent product line-up. 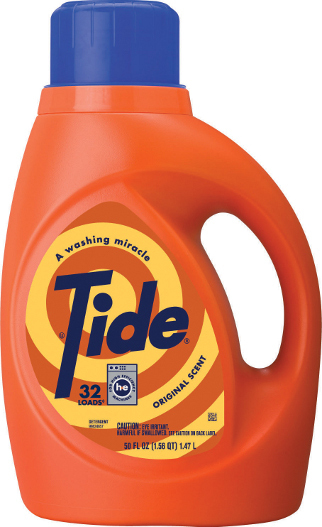 When the very first washing machine was invented, Tide was a choice for detergent. Today Tide is still a choice for getting clothes clean. Tide wants consumers to enjoy their retro packaging, hoping it will bring some past memories back to life. Tide has been a trusted brand for over 50 years, and its retro packaging showcases how this brand has grown. The retro and vintage look of Tide’s limited edition packaging shows how it looked years ago, but has the same performance qualities we know today. 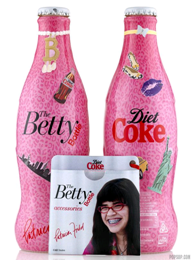 Celebrity Apprentice finalists meet 7UP as they designed retro packaging for their final task on the show. 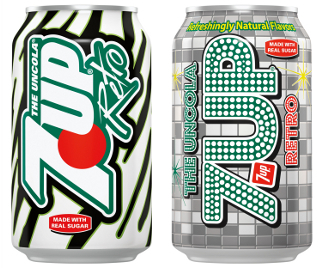 The retro look for 7UP displays the brand’s legacy from the 1970s and the 1980s. The retro designs showcase how 7UP is “The Uncola” with its crisp lemon-lime taste. It has been a great tasting brand for over 80 years, and the retro packaging lets consumers know how much it has evolved and stayed true to its roots. 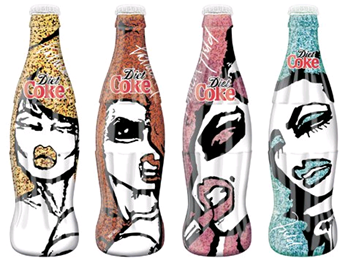 Retro packaging is a creative way to bring nostalgia and uniqueness to packaging. 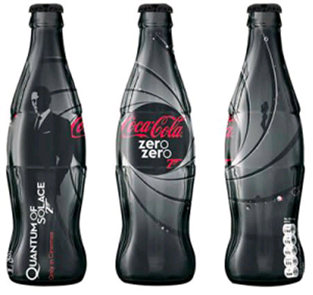 It gives consumers a chance to see how packaging has evolved and grown. For others, it takes them back to when they got their first washing machine and used Tide to clean their clothes, or when they drank 7UP at a family picnic, or when they ate Taco Flavored Doritos when listening to the radio. Retro packaging lets consumers get involved with the packaging and product, giving them a chance to experience something vintage. USB flash drives come in a variety of sizes, shapes, capacities, and designs. What used to be a simple and small data storage device, is now a something that not only stores information but also reflects an individual’s personality. There is no reason that flash drives have to be boring. Innovative and creative designs for flash drives help to bring a little touch of fun and spirit to these small device. Check out these new USB flash drives that have morphed from a device into an accessory. 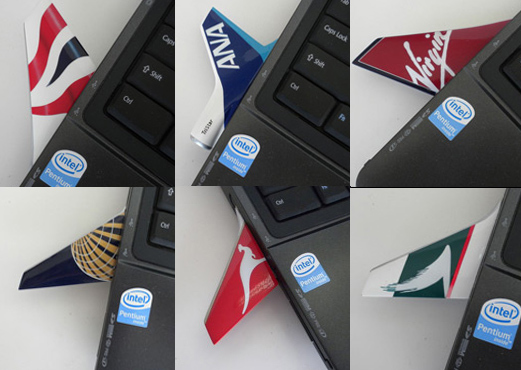 One of the newest flash drive designs is airliner tail fins that come painted with your favorite airline logos. These tail fins can give your computer wings! Another new flash drive design has powers all its own. 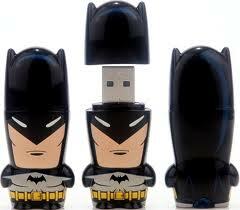 The newest character from USB flash drive designer Mimoco, was designed in honor of Batman’s 75th anniversary. The design was inspired by Batman’s original appearance from the 1939 comics. If I told you there was a rechargeable battery that recharges via USB that is also a flash drive would you believe me? Well its true! 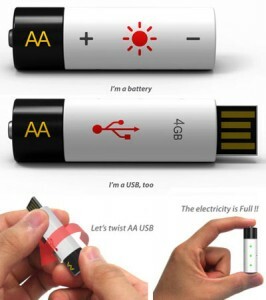 The new AA USB is here and is literally an AA battery form factor flash drive which is also a rechargeable AA battery. They have a removable adapter cap which allows it to be used in place of standard AA batteries and when the cap is removed, it can be plugged into an USB port to recharge. Who new a USB flash drive could be functional and luxurious. 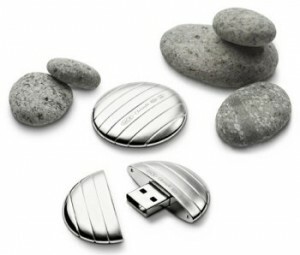 A new luxurious pebble shaped, silver plated USB flash drive has been designed and hand-crafted in France to add a designer feel to technology. The pebble shape allows for easy portability, while the design introduces elegance. QR codes are springing up everywhere you look. They are becoming a simple way for marketers to engage consumers. All a consumer needs is a mobile device with a camera and the ability to download the code reader application. With the amount of people owning a mobile device, marketers have vast amounts of people to reach. 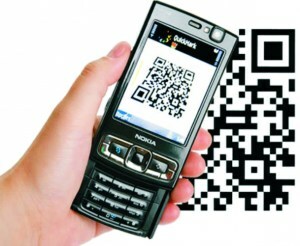 QR codes also allow marketers to unleash their creative side. These codes can lead a person anywhere a marketer wants. Whether the destination is to their website, a contest page, or even a separate page solely created just for the code, the possibilities are endless and creativity can really shine. There are many ways to use QR codes. See how many QR codes you see in a day, week, or month and look for how businesses are being creative using these codes. Ever have problems being the person making the coffee run and trying to remember how each person likes their coffee? 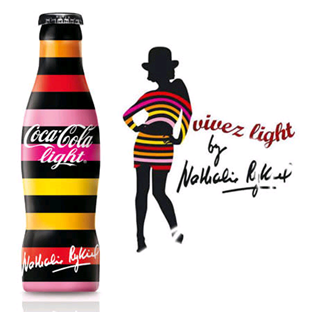 I came across this creative packaging idea that I have not seen anything like before. Josh Harris came up with the “Coffee Top Caddy”, which was created to help the people going on those large coffee runs for their co-workers. 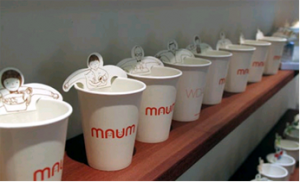 Many people are very specific on how they like their coffee, so with this invention, you do not have to worry about getting each person’s order right. These lids are designed to hold creamer and sugar packets right on top. Each person can then customize their own drink by adding however much cream or sugar that they would like. Not only does this form of custom packaging make the product more helpful, but it also makes the product much more distinctive. Customers will recognize and remember that your store has the creative lids that make the office coffee runs so much easier. Custom packaging lets you bring your own creativity and flair to your product’s packaging by matching the personality of your product or company. It also allows your product to stand out on the shelf above the competition. 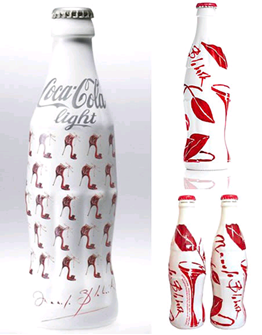 Creativity and innovation can be a part of both the product and the packaging with a connected theme. By doing this, consumers are interested in and drawn to your product more than they would be with plain packaging. 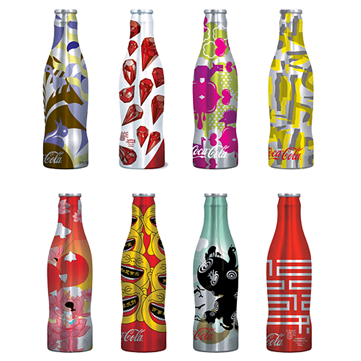 With custom packaging, you can create a design that matches the personality of your product. WDARU designed a line of creative tea bags for Maum that feature a variety of different little people that hook onto the side of your cup. They come packaged in boxes that match the theme of the characters inside. These cute little bags make drinking tea fun and different each time, which is a great way to get kids to drink tea. 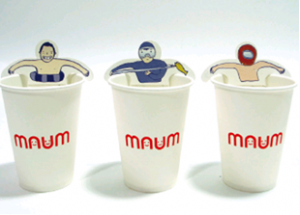 With these fun designs, people are sure to grab Maum tea off the shelf. 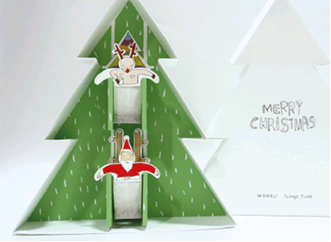 With some thought and creativity, you can really transform your product into an attention-drawing piece of art. By creating a series of custom packaging, you can differentiate your product from the competition and keep your customers coming back for more.